I am a Registered Veterinary Technician (RVT), baby and dog safety expert, certified dog trainer (ABCDT), wife, mother, and complete sucker for taking care of animals. My name is Jennifer Anderson and I am the founder of Pawsitive Transformation. Here’s my story on how this came to be. Mandy, my canine sister and furry compadre, was one of the main reasons I wanted to become a Registered Veterinary Technician. Mandy was a black cocker spaniel mix, my first dog, and a witness to my growing up. She saw me through scraped knees, dress up tea parties and my high school graduation. Her sweet, tolerant presence was always by my side and her memory lives on whenever I see children playing with their beloved family dog. Bali, or sometimes Balistar, for the star-shaped white fur patch on her chest, inspired me from the day we met. She was just under 3 months old when I first laid my eyes on her. She was recovering from being spayed through a rescue organization just days after she had been found on the side of the highway as a stray. Aware of her rough start, I knew that Bali missed her peak socialization period and needed not only love, but positive structure, empathy, and patience. Puppies experience what is called First Fear Imprint Period. This period occurs during their first 10 weeks of life. This is when pups are extremely impressionable and sensitive to both positive and negative experiences. With this in mind, I knew that a lot of patience, coupled with force-free training, would be needed to rehabilitate Bali. I needed to teach her that the bad life experiences she had already lived through could turn into something good. From fear to feeling safe and happy. During this time she quickly found her forever home in my heart and thus, our journey together in animal care continued. 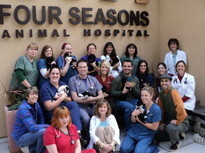 With Bali settling in, I was working as a vet tech at a local hospital, where I encountered my animal care crossroads. Over time I realized that the veterinary hospital was sorely behind on modern medicine, understaffed, and had no way of keeping up with the volume of patients that they were hoping to treat. The day I left I directly showed the attending veterinarian that some animals were in excrement-filled cages, others were not receiving proper pain management, and some needed tender touch for comfort that they were not receiving. I knew if I continued to work for this hospital I was accepting this type of care to be okay. It was not. I believe that we are to live in harmony with our furry friends, and that they are to be respected and cared for responsibly. I quit my job that day, and set my sites on one of the passions that Bali helped guide me towards—canine behavior. "You have start within your own home and heart to make the changes that you want the world to be!" Through my education to become certified as a dog trainer I had a "guiding light". Her name is Michelle Stone. Dr. Michelle Stone awesome-ly held a PhD in Animal Behavior. She used compassionate, effective canine training methods. She truly loved the dogs she worked with. As her apprentice, I saw dogs blossom and learn because they wanted to, not because they were forced to or scared of the consequences. Tails wagged happily and the scene was calm and relaxed. Gentle, flat collars and no-pull harness were used. The dogs focused on the handler out of fun and because it simply felt good to them. Shy dogs blossomed. High energy dogs learned to relax. As I learned, I felt in my bones (no pun intended) that my journey led me to exactly where I was suppose to be. Beside Dr. Stone. When Dr. Stone decided to relocate, she entrusted me to take her place as the head trainer at the Sequoia Humane Society, leading classes at the local farm store, and making ongoing private house calls. I loved what I was doing and embraced these years, but soon it was time for me to relocate as well. In the San Francisco Bay area I continued my work as a vet tech in a veterinary hospital that practiced high quality veterinary care. Four Seasons Animal Hospital set the bar for standard of superior, quality care while incorporating positive reinforcement and counter conditioning to the everyday veterinary handling and procedures that can be scary for animals. At Four Seasons, I was supported in my belief to incorporate animal stress management into my daily work. Here, I saw first-hand how behavior and veterinary care could meld. This was something I always knew was possible, and was now practicing daily—a beautiful dance of veterinary medicine and behavior. After years at Four Seasons Animal Hospital Bali and I packed up again and relocated to San Diego (following my love for my soon-to-be husband). 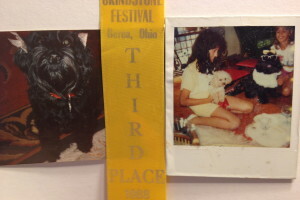 I worked as a dog trainer (independent contractor) beside Lena Botwright, the owner of Furry Tales Doggy Daycare. There, I conducted on-site training classes and individual dog training. I educated the staff on behavior management and understanding canine body language. I also continued to make private house calls, although they were much different than ever before. I was now working with dogs that lived in busy downtown San Diego. The dog's had very little grass, little open field exposure, and resided in high rises. New challenges that followed with success. San Diego is where I met the lovely Madeline Gabriel. Madeline is the founder of Dogs and Babies Learning and an expert in creating a safe and happy home for dogs and babies to live happily ever after. Mrs. Gabriel took me under her wing and provided me with bountiful, practical knowledge. I firmly grasped this knowledge and love educating others through my Be A Star program, Parent Empowerment Training (P.E.T.) program, and educational seminars. After what already seems like a lifetime of learning (in dog years), my roots are firmly planted in Seattle. Bali now 12 yrs continues to be my inspiration. My husband and I welcomed our son in 2013, and daughter in 2016. My human babies give me the drive to share my safe, daily practices to all those who will listen. Through Pawsitive Transformation, I am looking to offer back the gifts I have acquired along the way. I will listen, I will help. I strive to make a difference, one dog and one family at a time. ​Jennifer has taken an oath to use only science-backed, positive reinforcement based training and behavior modification. ​Jennifer is a dog service professional committed to ethical business practices. ​Jennifer is a recommended trainer of Greyhound Pets Inc. She provides education, training, and guidance to the volunteers, fosters, and staff of GPI. She also hosts seminars at their kennel location and performs private house calls for any adopted dog in need. ​Jennifer is a recommended trainer of 6dogrees Rescue. She enjoys helping these "last chance" dogs that are routinely pulled out of high-kill shelters in California. Education, training, and guidance is provided to the fosters and private house calls are available for all adopted dogs of 6dogrees Rescue. ​Jennifer has held numerous K9 body language seminars at the Everett Animal Shelter providing education for the volunteers of Animal Rescue Foundation and surrounding community. ​Jennifer passes on her knowledge of BSL (breed specific legislation) through donating her time to Pinups for Pitbulls during their annual events. 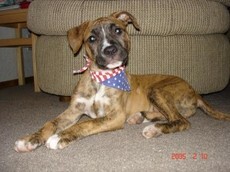 Jennifer's own dog, Bali, continues to be her inspiration for all that she does and stands for.